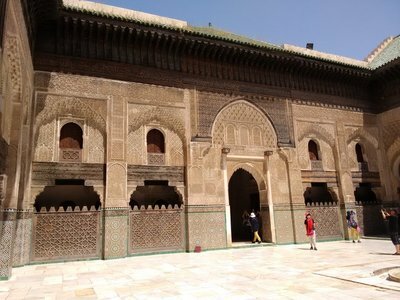 Medersa Bouanania, Fes, Morocco. 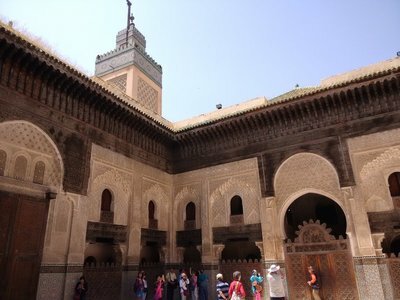 - Medersa Bouanania, Fes, Morocco. Bouanania Medersa, constructed between 1351 and 1357, during the era of the Merinides is one of the very few Moroccan religious sites open to non-Muslims, admission fee is 20 dirhams and there is no requirement to remove shoes before entering the site, which is normally mandatory in all mosques, Zaouias and Koubbas, photography is unrestricted except for the students prayer hall which is accessible to Muslims only. The dark cedar wood intricate wall carvings are now looking rather bleached after exposure to centuries of intense sunlight, but it's still a magnificent and atmospheric ancient structure. 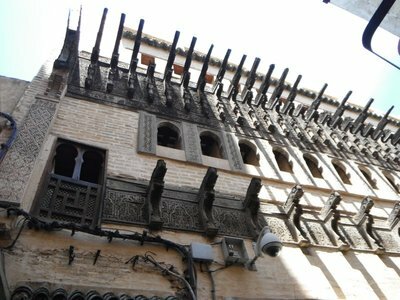 The upper floor and Madrasah student' rooms are also inaccessible to visitors, the ground floor is tiled in marble and features a central ablutions fountain, but most interesting of all is the fascinating unique Magana hydraulic water clock, part of the Medersa's estate across the street opposite the Medersa front door in the Talaa Kebira, the wooden arms of the structure protruding from high up on the wall have recently been restored but still await the return of the thirteen brass bowls, an integral part of the clock, removed for analysis, but so far nobody can discover its function, apparently the skills of modern-day horologists cannot match those of their medieval counterparts! 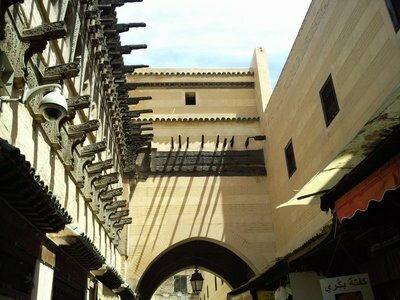 A Bouanania tourist trail information board is mounted beside the Medersa front door in the Talaa Kebira, if planning a visit it's advisable to arrive early before the narrow street becomes cluttered by official tour groups. 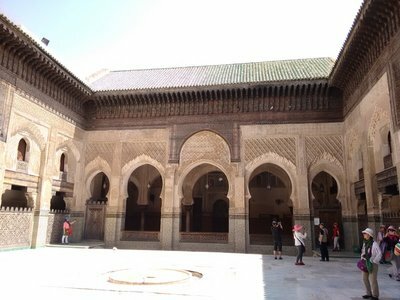 the tiled arch at the Medersa front entrance. Hello Irene, and thanks for your kind remarks on my Bouanania blog, I'm new to this travel website,and still fumbling around with the complexities, I usually write on Tripadvisor website under the 'nom de plume' of Kaptainsensible, but Trip's photo upload system is currently a shambles so I hopped over to Travellerspoint to store my many photos. 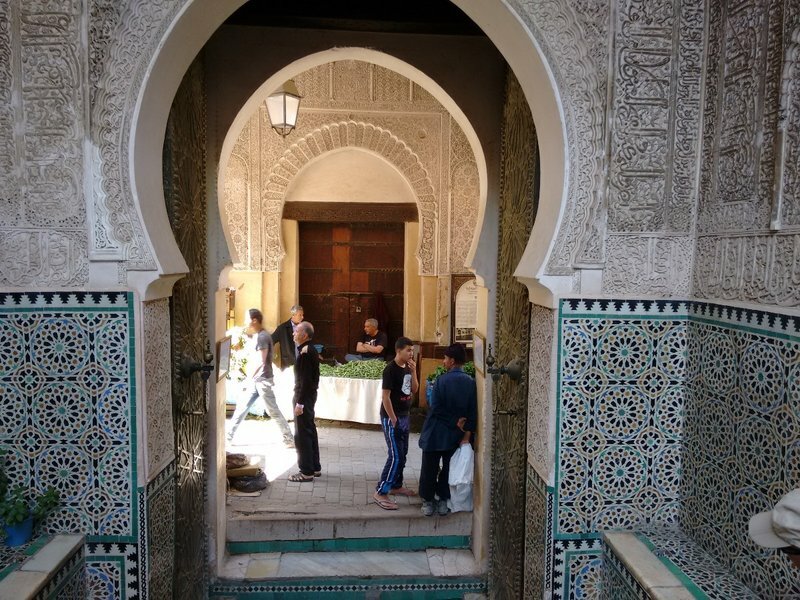 If you DO land in the mean streets of Marrakesh there is an easy escape plan, numerous buses can whisk you away from the main bus station at Bab Doukkala to my favourite place, Essaouira, only a three-hour journey to an entirely different world on the Atlantic coast. 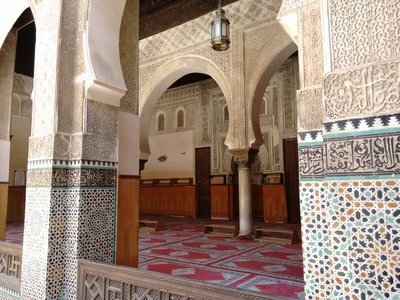 The Nahon Synagogue, Tangier, Morocco.